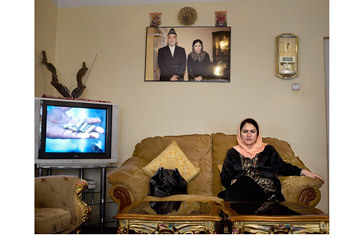 The parliamentarian Fawzia Koofi says Afghan women cannot be "the sacrifice by which peace is achieved"
This didn't happen 10 years ago, when the Taliban ruled Afghanistan. It happened last year. Now hidden in a secret women's shelter in the relative safety of Kabul, where she was taken after receiving care from U.S. forces, Aisha recounts her tale in a monotone, her eyes flat and distant. She listens obsessively to the news on a small radio that she keeps by her side. Talk that the Afghan government is considering some kind of political accommodation with the Taliban is the only thing that elicits an emotional response. "They are the people that did this to me," she says, touching the jagged bridge of scarred flesh and bone that frames the gaping hole in an otherwise beautiful face. "How can we reconcile with them?" That is exactly what the Afghan government plans to do. In June, President Hamid Karzai established a peace council tasked with exploring negotiations with Afghanistan's "upset brothers," as he calls the Taliban. A month later, Tom Malinowski, the Washington advocacy director for Human Rights Watch, a New York  based NGO, flew to Kabul seeking assurances that human rights would be protected in the course of negotiations. During their conversation, Karzai mused on the cost of the conflict in human lives and wondered aloud if he had any right to talk about human rights when so many were dying. "He essentially asked me," says Malinowski, "What is more important, protecting the right of a girl to go to school or saving her life?" How Karzai and his international allies answer that question will have far-reaching consequences. Aisha has no doubt. "The Taliban are not good people," she says. "If they come back, the situation will be worse for everyone." But for others, the rights of Afghan women are only one aspect of a complex situation. How that situation will eventually be ordered remains unclear. As the war in Afghanistan enters its ninth year, the need for an exit strategy weighs on the minds of U.S. policymakers. The publication of some 90,000 documents on the war by the freedom-of-information activists at WikiLeaks  working with the New York Times, the Guardian in London and the German newsmagazine Der Spiegel  has intensified international debate. Though the documents mainly consist of low-level intelligence reports, taken together they reveal a war in which a shadowy insurgency shows determined resilience; where fighting that enemy often claims the lives of innocent civilians; and where supposed allies, like Pakistan's security services, are suspected of playing a deadly double game. Allegations of fraud and corruption in the Afghan government have exasperated Congress, as has evidence that the billions of dollars spent training and equipping the Afghan security forces have so far achieved little. In May, the U.S. death toll passed 1,000. As frustrations mount over a war that even top U.S. commanders think is not susceptible to a purely military solution, demands intensify for a political way out of the quagmire.